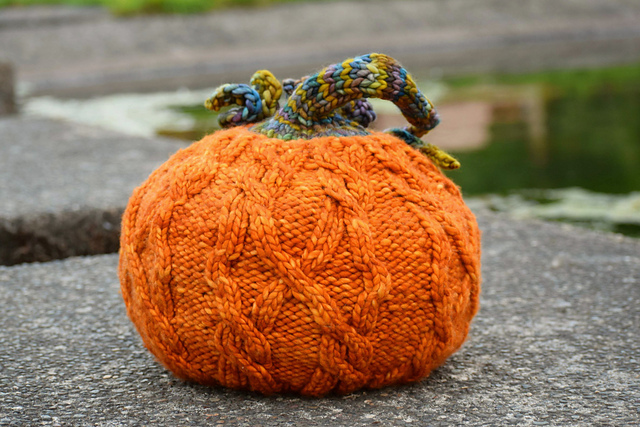 This jumbo pumpkin is a joy to knit. Cables that twine over the surface are reminiscent of garden vines. 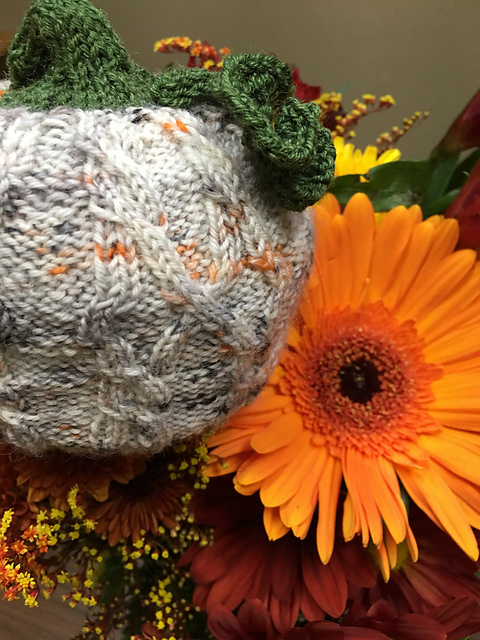 Knit in the super-bulky yarn called for, your pumpkin will be a statement piece, but it will be amazing knit in any weight yarn. Pumpkin may be knit in any weight yarn. Try sock yarn on US size 1 needles, sport weight on US size 2 needles, worsted on US size 5. You will want to knit the pumpkin at a tighter gauge than normal so that the fiberfill does not show through. I used nearly 3 skeins of Malabrigo Rasta in Sunset for the body of the pumpkin, and about 1/2 skein of Rasta in Arequita for the stem and a large tendril. Diameter and height will vary depending on amount of fiberfill used. Other materials needed: 1 stitch marker for beginning of round, additional stitch markers if desired, cable needle, tapestry needle, 1 bag (16 oz.) polyester fiberfill (my favorite is Cluster Stuff by Morning Glory). in Amanda Hope Yarns sock yarn in Spooky 2018.